The Second Annual Sloppy Shopping Extravaganza occurred this past weekend...and it was great! An evening of hanging out, drinking, shopping, drinking, and eating with the gals - how fun is that? This year had a particular highlight. 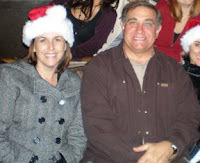 We got to meet Dan Lauria, known to most of us as Kevin Arnold's dad from The Wonder Years (or, Jack Arnold). We bombarded him at the bar, and he was gracious enough to humor us for a good 15 minutes. After the fact, we all felt bad for interrupting his night, but I have to say he was extremely kind to us. Thank you for humoring us, Mr. Lauria. You made our night! Cool! Is that you in the picture with him?